Fanta had experienced a decline in the number of teens purchasing the product as its marketing activities had not directly engaged them in recent years. Teens are constantly on the lookout for new and different things to talk about within their social circle and their choice of brand tells their peers a lot about them. A brand that isn’t perceived to do cool things is consequently not top of mind and a decline in the number of teens purchasing their product had occurred. Instead new, innovative and ‘faddy’ drinks had encroached on its market share and Fanta was perceived to have lost relevance and a connection with its target demographic. The brand needed to reconnect with its teenage audience, positioning Fanta as cool, exciting and a brand to be revered among their peer groups. All communication needed to be fun, participatory and interactive, and ultimately drive purchase of Fanta among its core demographic while creating a word of mouth buzz that would elevate both the credibility and desirability of the brand. Ikon Communications’ approach began with the concept that it needed to build relevance for Fanta by creating ‘play’ in teenagers’ lives. Ikon felt that lives began to become that little bit more serious during the teenage years with the introduction of exams, homework and other pressures. It, therefore, sought to give teens something to take them away from the ‘boring and serious’ moments in their day-to-day world and give them the tools for a fun, playful and participatory experience. Mobile phones are the most ubiquitous channel for teens, with smartphone penetration in this target group increasing month on month. It was therefore the natural channel to use to engage the target audience. The average age for ownership of a first phone is 13 (Mobile Youth Survey 2011) with smartphones accounting for 46% of all phones in Australia and 57% of all new phones sold (Australia’s Smartphone Index 2011). Further, Apple has made the smartphone the must-have accessory for every image-conscious teen, where they are seen as a digital version of who they are, from the apps they have to the games they play. The universal access to a mobile screen and the rise of mobile gaming was therefore a perfect platform for Fanta to deliver a resonant and playful experience to bring back its lapsed teenage audience to its brand. A mobile gaming-based campaign with custom-built games (iPhone and Android) was developed to engage teenagers, with integrated Facebook and outdoor activity, inviting them to play when they were at their most receptive: during their commute or when just hanging around with friends. Three custom-built games were developed using both touch screen and tilt centres, fully leveraging the smartphone’s user interface. 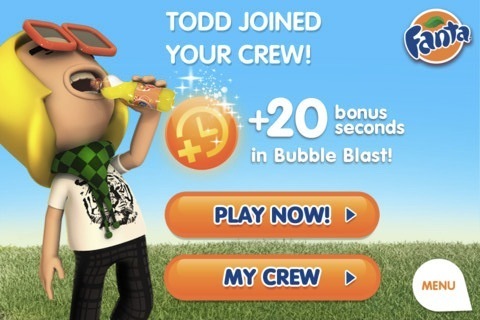 The games featured different members of the Fanta ‘crew’ and weekly prizes and a real time leader board were built-in to drive repeat participation. 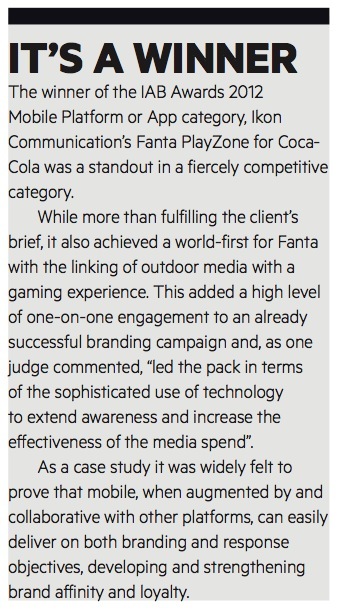 User’s interactions were synced to Facebook, where scores were published on their wall, which helped spread the word about Fanta PlayZone within their network, and provided social amplification of each engagement to help with peer-to-peer word of mouth buzz. 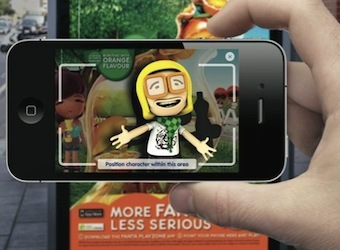 To raise awareness of the app and drive downloads, online display, Facebook, mobile and out-of-home media invited teens to ‘play’ with Fanta. Outdoor media was used in a highly innovative way to deepen engagement and maximise participation. Players could boost their scores by using the app to interact with outdoor media billboards that were situated in the places that teens hang out and seek entertainment in. Using location-based information within the app, users were able to locate these outdoor panels and using their smartphone cameras could ‘catch the crew’. When caught on camera, the crew member magically jumped out of the billboard and into the user’s phone via augmented reality to provide a ‘power-up’ in their gaming experience. In addition, users had the opportunity to rule their local Fanta ‘zone’ by gaining the highest score in real-world locations with the use of GPS software to score bonus points and earn local kudos. Fanta PlayZone was a truly integrated mobile campaign that engaged its target audience by delivering an experience true to Fanta and adding more fun and playfulness to the world of a teenager. Over 36,000 people downloaded the app, which resulted in over 102,000 visits. To put this into context, at 2.6 minutes per visit, with an average of six visits per user, each user was spending an average of 11 minutes playing and engaging with the brand. The judges felt the social connectivity, with all mobile interaction feeding into Facebook, encouraged healthy competitiveness and helped extend the engagement the audience had with Fanta. This was proven, with 65% of visitors to the app returning to play. Most importantly, the campaign had the desired impact on the bottom line with sales of Fanta increasing by 12.3% year on year. 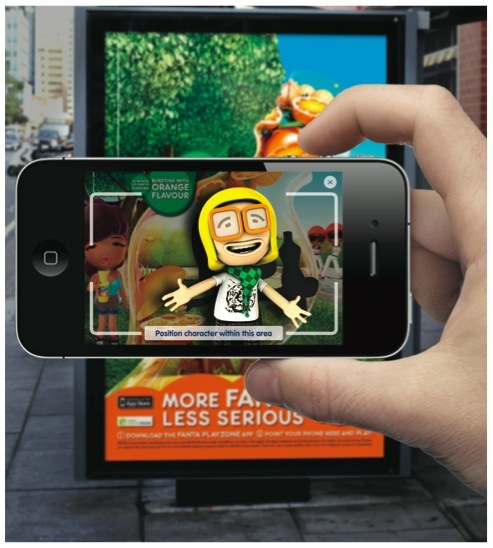 The campaign’s innovation in linking outdoor media with mobile gaming via augmented reality was a world first for Fanta and an element of the creative execution that most impressed the judges. They noted that this smart use of advanced technology maximised the value and impact of the media spend and ensured “all touch points drove interaction and participation” with the campaign. The ‘slick user-experience’ was also highlighted as a key driver in the campaign’s ability to drive relevance, re-engage lapsed Fanta fans and ultimately encourage a purchase. The bespoke games with their imaginative characters encouraging teens to be ‘more fun, less serious’ and by linking the creative to all other media, consistency and extension of brand messaging was guaranteed. In summarising the campaign, the panel asserted that it was a clever case study in how mobile is now being used as a tool to both brand build and drive a response. It reveals how a core mobile campaign can be augmented by sophisticated interaction with other media and a great example of an initiative with no static brand messaging thanks to intelligent cross-platform integration.